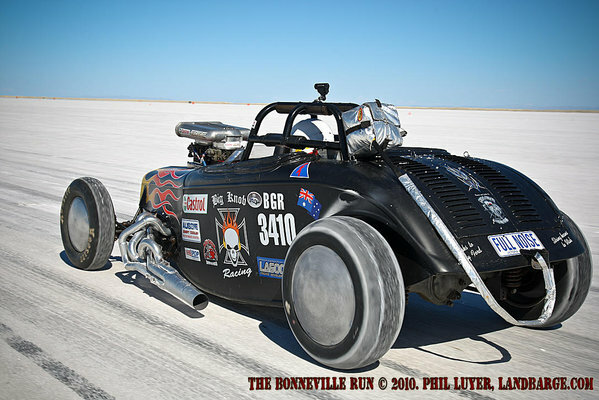 The SCTA's Bonneville SpeedWeek 2010 was the centrepiece of our trip, with plans in place for us to meet up with almost 20 other Australian travellers out on the salt, most of them also making their first visit to the hallowed Bonneville Salt Flats. 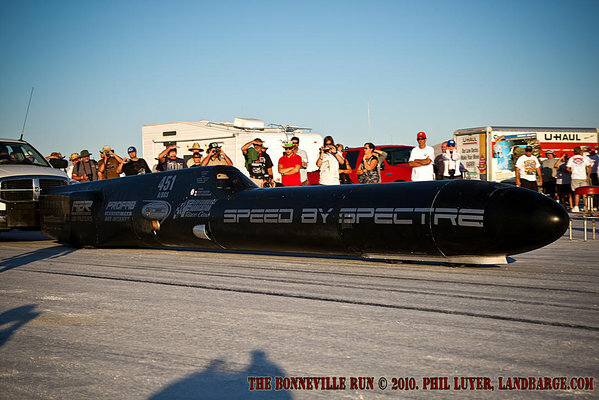 We were looking forward to seeing Norm Hardinge and the Aussie Desert Coolers / Big Knob Racing team taking a shot at the 200 mph mark and personally, I'd been hoping to get to see the Speed by Spectre "Infidel", a Cadillac big block powered streamliner who's owner has set a long term goal of 400 miles an hour on gasoline. Last year, they set a record at 330mph, and this year, they went over 20mph faster, with average speeds of 356mph from the 'slow' A class motor. As of Tuesday afternoon, they're now stepping up to their AA combo and pushing for another record over the rest of the week. The Big Knob Racing team also managed to hit their marks this year, with a best speed of 200.1mph as of Tuesday afternoon, however they've hurt the clutch in the car in the progress and will have to wait for for next year to improve their Bonneville scorecard any further. Another car that caught my eye on the salt was the turbocharged Suzuki Kizashi being built by Road & Track Magazine. These guys ran 197mph in licensing this morning in order to get approval to run the long track of the combo course, and when they ran the long track this afternoon they ran 203mph on a 202mph record. They're in impound now and will be trying to back up the record first thing tomorrow morning. 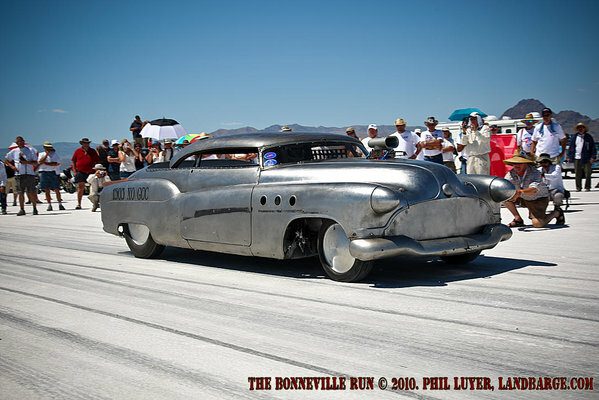 One of the crowd favourite cars on the salt today was the Jeff Brock / Brooks and Dunn Bonneville Bombshell Buick, built by Jeff Brock and run this year by Jeff and Ronnie "Cowboy" Dunn of Brooks and Dunn.